Three political analysts flash three signal lights in today’s regional press – one red, one yellow and one green. The “red” comes from Abdul Rahman al-Rashed, head of Alarabiya TV new channel. He says the Syrian opposition risks disappointing its people and aborting the Syrian revolution if it did not team up and unite. Rashed says, “Russia, China and even the United States have all declined to recognize the opposition, saying they didn’t know which opposition to recognize. “Were the opposition’s inability to unite continue in the coming weeks,” Rashed warns, “the opposition would have killed off the revolution and betrayed millions of Syrians” who look forward to the day when this “evil regime” passes through the gates of death. The “yellow” light comes Lebanese political analyst Hazem Saghiyeh, writing for the Saudi-owned daily al-Hayat. After the Syria resolution passed by Arab League foreign ministers at their meeting in Cairo on Sunday, he says, chances of the Syrian-Turkish front heating up have increased. This would complement regionalization of the Syrian crisis that has already brought in armed clashes in northern Lebanon, flows of Iranian and perhaps Lebanese combatants to fight alongside the Damascus regime and of Iraqi and other combatants to fight back alongside the insurgents. In other words, says Saghiyeh, co-opting the Syrian Kurds to invigorate the uprising requires “major concessions and assurances from both sides to overcome their mutual fears and suspicions.” It goes without saying, he adds, the (Syrian Arab) opposition majority needs to reassure the (Syrian Kurdish) minority first and not the other way round. This new gain for the Syrian opposition was achieved after months of behind-the-scenes opposition diplomacy, intra-Kurdish negotiations and intervention from the U.S. and regional countries. This has resulted in the triumph of pro-U.S. and pro Massoud Barzani diplomacy over a pro-Iranian alternative supported by the Kurdistan Workers’ Party (PKK). There is no exact data on the size of the Kurdish population in Syria, but the most conservative estimate puts their number at two million -- around 10 percent of the total population. This makes them as important as the Alawite minority, which has ruled Syria for decades. Kurds reside mostly in the north and northeast of the country, in proximity to the Kurdish population of Iraq and Turkey. Besides, both Aleppo and Damascus have a strong Kurdish presence. Their geographical location adds to their political weight in the country. Syrian Kurds have the potential to be a revolutionary force against Assad’s regime… Nevertheless, for a multitude of reasons, the Kurds’ participation in the Syrian uprising over the last nine months has not been as strong as that of the Sunni Arabs, and their regions have remained relatively calm. The PKK, fearing the growing influence of Turkey in the SNC and encouraged by Iran, has decided to repair its old alliance with the Syrian regime… According to confidential sources, it was the PKK’s armed group that killed Mishal Timo, a leading member of the SNC. The presence of strong pro-PKK elements in Aleppo accounts, for instance, for the lack of major opposition activities in the city. However, the PKK’s activities and policies seem to be running against strong resentment and resistance by local Kurds who have no sympathy for Assad’s regime. Moreover, the alliance between the U.S., Turkey and the Kurdistan Regional Government (KRG) in northern Iraq has managed to mitigate the impact of the PKK among the Kurds in Syria to a considerable degree. During the last month, Iran invited top KRG officials to Iran and warned them against assisting the Syrian opposition. Nevertheless, Iraqi Kurdish leaders had to heed a much stronger pressure coming from Turkey and pro-U.S. allies. 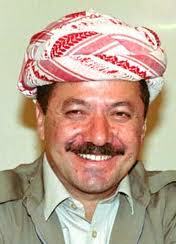 Massoud Barzani, president of the KRG, was the focus of this pressure. He met with Joe Biden, vice president of the US, Burhan Ghalioun, president of the SNC, and pro-Saudi Arab leaders from Lebanon, such as Samir Geagea and Walid Jumblatt. In addition, Barzani received several letters and telephone calls from regional leaders. All these visits and contacts were urging him to use his influence to encourage Syrian Kurds not to heed the PKK and Iran’s advice and to join the Syrian opposition in their struggle to topple the government.